*Azmari EdTech is not responsible for altered memories or reduced temporal lobe functionality. Level of mastery may vary. Can't help but feel like Degree Mill's defensive protection isn't as strong as it seems. The main problem is that the Runner gets to decide which cards to shuffle back. Best-case scenario, you force the runner into shuffling back the first few things they installed (a console or Mopus perhaps) to prevent you from being at game-point. But the expected case will often be runners sending back SacCons, extra Rabbit Holes, even Tapwrm. And it can get even worse when a runner shuffles back a depleted Armitage, Liberated, D4v1d, etc. to be installed and re-used again. I agree that this 5/3 is excellent when scored in the early game but it definitely weakens as the game goes on. Yes, it's nigh unstealable turn 1 but are you really going to IAA it and leave your centrals open? 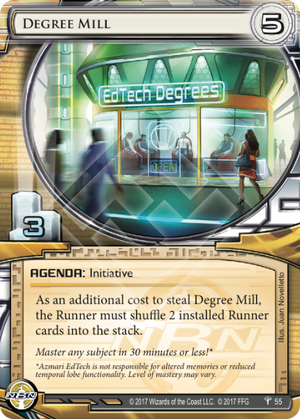 This has a place, for sure, in NBN rush decks like what we can expect from the new Azmari EdTech. Overall though, I think Global Food Initiative reigns supreme as the better defensive option and SSL Endorsement for a more consistent tempo swing. It's fantastically defensible on the first turn, demanding at least three of the runner's clicks to steal it. In fact, unless they're Hayley Kaplan: Universal Scholar, Apex: Invasive Predator, Adam: Compulsive Hacker, or have Mass Install(???) they straight up can't steal this on their first or second click. Put it behind a Jua or Data Loop and make the poor runner's hand and board state disappear. No amount of sacrificing cards can prevent it. Barring an appearance from the Witch in Green, it will be a tempo hit for the runner, and for those that run lean with only a few important installs, this thing will be disastrous. Excellent defensive 5/3. Expect to see this, and subsequently FC, everywhere in the near future.